Pack size: 1 x 500ml bottle. Review Sensitive Eyes I prefer to rinse my lenses with pure saline after they've been soaked in the multi-purpose solution before I put them in. It's less expensive than using the multi-purpose solution as a rinse and less chemicals going into the eyes. Review Sensitive Eyes Always use same item with my contacts and never had any issues. Review Sensitive Eyes Very good solution in a larger size compared to Lens Plus and excellent value for money. The Sensitive Eyes daily contact lens cleaner solution is a dedicated treatment for keeping contact lenses in the best possible condition. 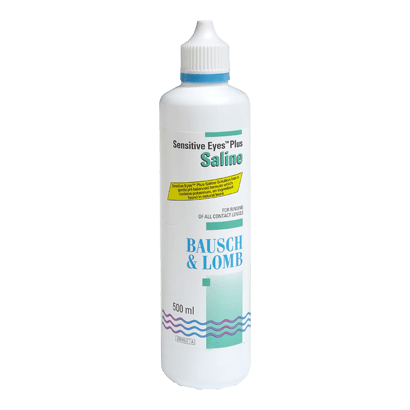 The solution from the eye experts at Bausch & Lomb helps to remove particles and bacteria from lenses in the most effective of ways. Offering a safe cleaning method for regular users of contact lenses, the Sensitive Eyes treatment is ideal for both dailies and extended wear lenses. The treatment solution makes use of a saline based content for optimum results and effectiveness. The Sensitive Eyes solution works on the principle that a failure to keep contact lenses clean can bring about a build-up of unwanted and uncomfortable detritus that could be harmful to the eyes and optical nerves. The sterile and isotonic Sensitive Eyes solution contains the formula to treat this possible escalation of material. The hydrogen peroxide disinfection techniques can guarantee clean and healthy contact lenses. The method for gaining the best from this solution is easy. Simply place three drops of the solution onto each lens and rub them for twenty seconds. The solution must be applied to each side of the lens. After this time has passed the lenses can be rinsed thoroughly with the solution. The solution is available to order now in an easy to use bottle.